Discussion in 'Cards: Strategy and Rulings Discussion' started by Azure, Dec 20, 2007. 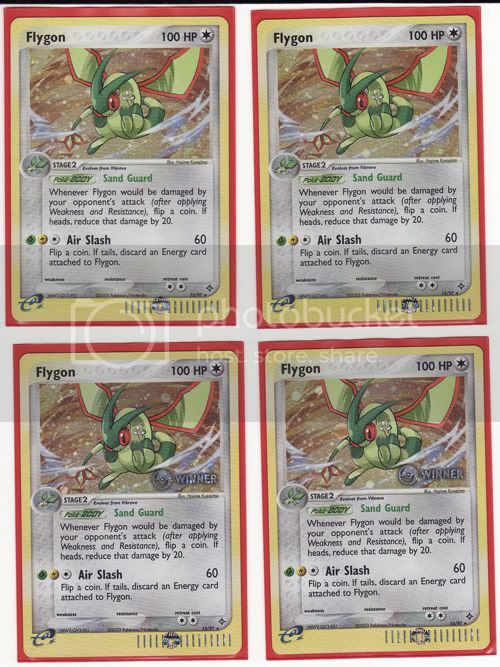 I recently got four copies of Flygon from the Dragon series. Two of them are holo while they should have been non holo and two of them are holo with a Winner stamp on them. What are they? Promos given away at the Pokemon League. There was a whole set of cards with the Winner stamp. By the way, here is a scan of them. So it wasn't for any special event right?